When is Halloween and Why is Halloween celebrated ? Trick-or-treating is a customary practice for children on Halloween in many countries. Children in costumes travel from house to house in order to ask for treats such as candy (or, in some cultures, money) with the phrase “Trick or treat!”. The “trick” is a (usually idle) threat to perform mischief on the homeowners or their property if no treat is given to them. And this practice is now starting in Bangalore. 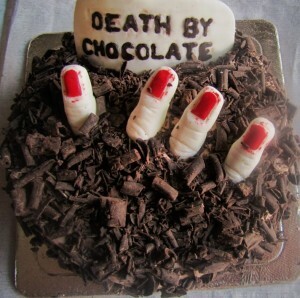 How about sending a gory cake to your family and friends in Bangalore this year? Try our gory version of the famous Death By Chocolate Cake. Place your orders now, for delivery in the evening. Call us at 8971000300 to place your Halloween’s Cake.